Protesters calling for a referendum on the final Brexit deal are gathering in London for what organisers say will be the "biggest, loudest and most important" demonstration of its kind. 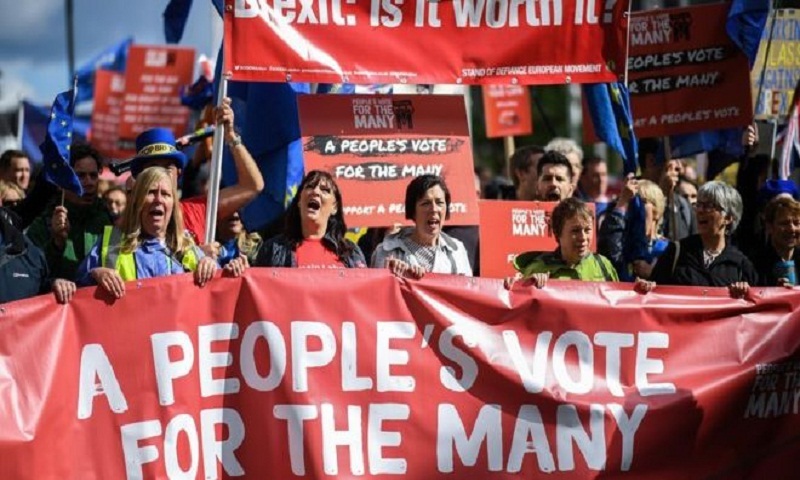 The event, organised by the People's Vote campaign, will see a march ahead of a rally in Parliament Square. Young voters will lead the march, which organisers are expecting to be more than 100,000-strong. MPs from all the main political parties are supporting the demonstration. Prime Minister Theresa May has ruled out a referendum on the outcome of the Brexit negotiations under any circumstances. The British public voted to leave the EU by a margin of 51.89% to 48.11% in a referendum in June 2016. The UK is scheduled to leave on 29 March 2019, under the terms of the two-year Article 50 process. Labour's Lord Adonis, a campaigner for People's Vote - which wants a referendum on the outcome of the Brexit negotiations - said: "Brexit's becoming a dog's dinner. "This week's fresh chaos and confusion over Brexit negotiations has exposed how even the best deal now available will be a bad one for Britain. "It's a mess that nobody voted for and the reason we're in such a growing crisis is that those cheerleading for Brexit know the promises they made can never be kept." Some 150 coachloads of people from across the UK - including as far away from London as Orkney - are heading to the march, which begins in Park Lane at midday. Mayor of London Sadiq Khan is among those expected to speak, along with representatives from the main political parties. Celebrity speakers will include Steve Coogan, Delia Smith and Deborah Meaden. Carmen Smith, For our Future's Sake Supporter from Wales, who will be speaking at the event, said: "The biggest problems are still to be negotiated, many of the consequences are still being concealed and, if we carry on like this, the arguments will never end. "That's why the People's Vote March for the Future will be led by thousands of young people - students, apprentices and everyone starting out in life - whose voices have too often been ignored."